Touring bikes are not all designed with the same purpose in mind, in the same way that cars can be optimised to suit high-performance (sports cars), off-road tracks (4x4s) or utility (vans). Yep, like cars, there are lots of subcategories of touring bike that are all optimised for slightly different purposes. By getting the bike that best matches your needs, you can make your bike tours easier! It took me a while to understand each category, but having written extensively about touring bikes for a while now, I will explain them all to you. – I discuss frame geometry in this article for those who are unfamiliar with what it all means. 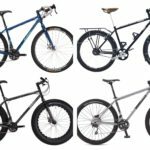 – If you’re interested in the different touring bike manufacturers, check out the Complete List of Touring Bikes Available. 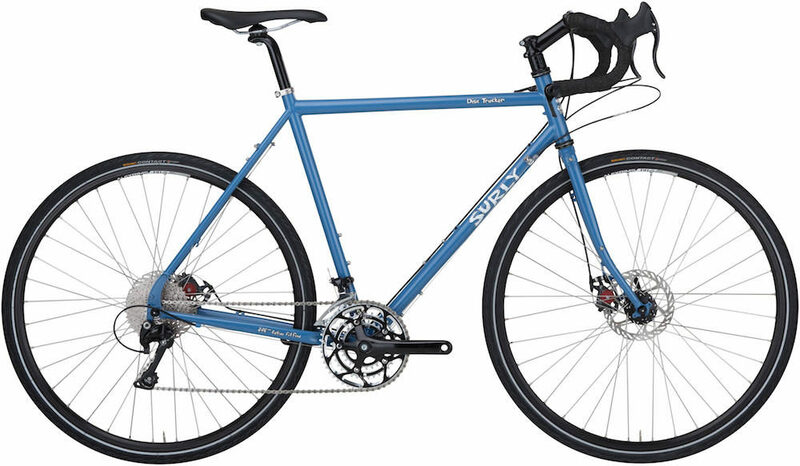 The Latest Surly Disc Trucker long distance touring bike. These touring-specific bikes are designed around long distance bike travel, making them very capable at handling heavy loads on all types of terrain. Most often, steel long-distance frames are stiffer than anything else available because they use heavier frame tubing in larger diameters. Long Distance bikes have a wide range of gear ratios to get you up the steepest hills, provision for a front rack, comfortable seats, three bidon cage mounts, long chainstays for ample heel clearance of your rear panniers, and a long, stable wheelbase. In addition, you will be able to mount touring specific tyres over 40c (700c) or 2.0″ (26″) in size. Long Distance touring bikes are what I recommend for big tours. The geometry charts show slack head and seat tube angles, high trail, long headtubes, long chainstays and low bottom brackets. The Specialized Sequoia light touring bike. Light tourers use a tweaked road bike geometry to produce a fast bike that takes racks and panniers. Given the narrow tyres and lightweight nature of many of the parts, they are best suited to road-only use. Typically you will find 700c wheels with narrow tyres, similar geometry to a road bike and higher gear ratios – all of which are perfect for sealed roads. Be aware that there is often limited space for wide tyres/mudguards, and that there is often no small chainring ratio for steep climbs. The geometry charts show that almost all measurements (head angle, seat angle, chainstay length, fork trail) are somewhat halfway between that of a long distance touring bike and a road racing bike. 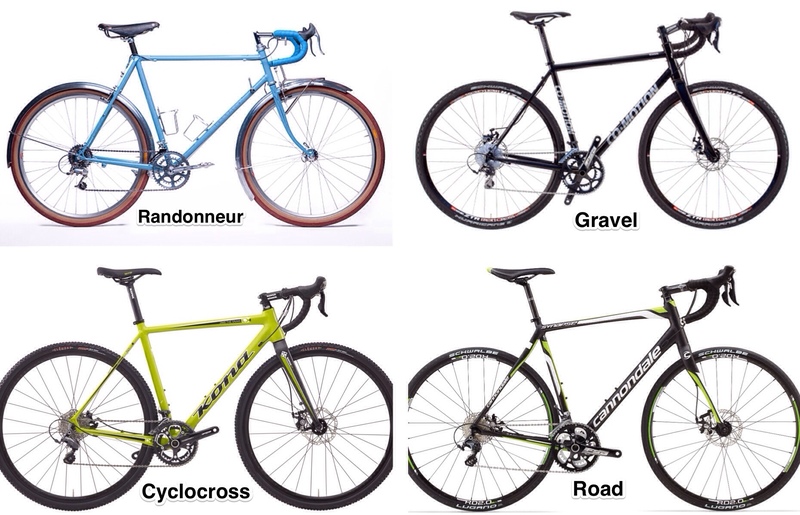 They share a lot of geometry characteristics and handling features with cyclocross/gravel bikes. 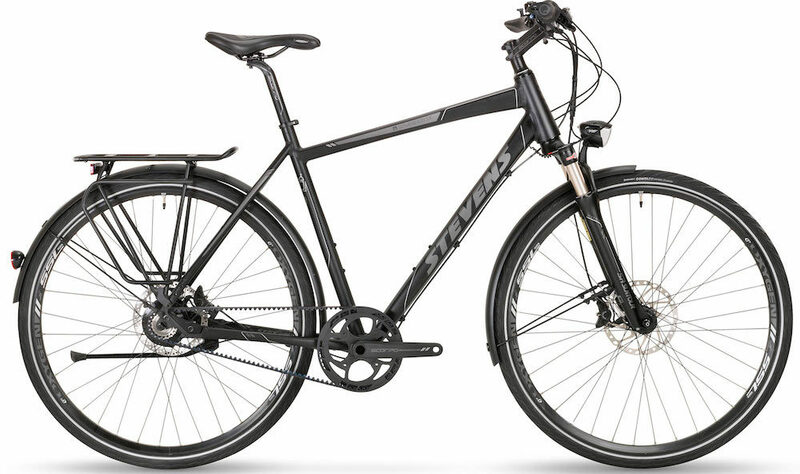 The Stevens Soverign SX R14 trekking bike. Based on a ‘hybrid’ bicycle, this style of bike is most popular with European brands. They are often designed around light loads, equipped with a rear rack only, a suspension fork, an aluminium frame and gear ratios suited to sealed roads and bicycle paths. Trekking bikes can be as fast as ‘light touring’ bikes, but with the added bonus that they are more upright. The geometry charts show slack head and seat tube angles, high fork trail, long headtubes, long chainstays and low bottom brackets. The Tout Terrain Panamericana dual suspension touring bike. This touring bike subcategory is essentially a dual suspension mountain bike with tweaked angles and a higher front-end. With racks built above the suspension, it allows your pannier weight to be ‘sprung’ with you. The result? Suspension dampening that works effectively! I’d love to test ride one loaded up, on rough terrain. The Surly Big Dummy long-tail cargo bike. Long-tail cargo bikes are great for big loads, carrying oddly shaped objects, or transporting children. You can squeeze two children’s seats on the back tray as well as loads of gear! I’ve seen cargo tourers carrying para gliders, surfboards, or simply cycling with extra panniers. The Nazca Pioneer touring recumbent. sore shoulders? Sounds pretty good to me. 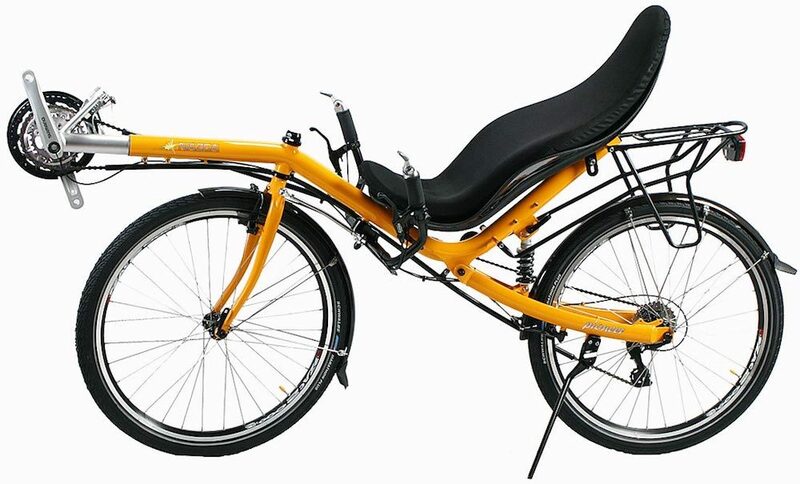 There are disadvantages to riding recumbent too: when climbing steep hills you cannot use your body weight to push the pedals down, riding in traffic you are far less visible to cars, and it can be harder to obtain spare parts. 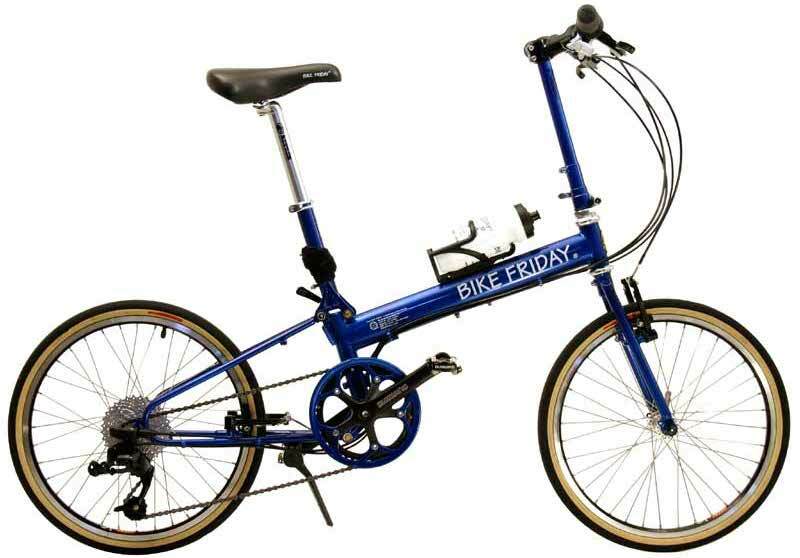 Bike Friday New World Tourist folding bike. Folding bikes can make brilliant touring bikes. There have been many times where we’ve needed to use trains, get in trucks or hitchhike where we wished our bikes just folded up. Dealing with public transport is without doubt the most stressful time when we’re travelling. The Co-Motion Equator touring tandem. I originally ignored the idea of touring on a tandem with my partner, but the more we rode regular touring bikes separately-but-together, the more we wanted to switch to a tandem. Tandems are faster, more social, good for inexperienced cyclists (at the rear) and great for couples with a large difference in speed/ability. Note: Tandems also come as folding, recumbent and semi-recumbent bikes. A bicycle marketed at ‘cyclocross’ can make a great touring bike, as the geometry is almost the same as a ‘light tourer’ – albeit with shorter chainstays. Cyclocross bikes are best used with light loads given they have lightweight parts and a gear range that lacks low end gears. Many people swap out the drivetrain to something with a wider gear range. Example: Kona Jake the Snake. Over the past couple of years, the bicycle industry has created this “new” category. Gravel bikes essentially have the same geometry as ‘light touring’ bikes, and some even have eyelets for a rear rack. The thing that makes them different is that they’re built lightweight, and hence aren’t reinforced for heavy pannier loads… so again, light loads only. Example: Co-Motion Klatch. Given that you can ride a brevet/randonee/cyclosportive event on almost any bike, randonneur/audax bikes as a marketed product aren’t too common. In fact, most bikes found with this name attached are custom builds. The current trend is to use 650b wheels and wide tyres to maximise rider comfort. Example: Soma Grand Randonneur. Road bikes (and their subcategories) can be great for lightweight road touring. You can use bikepacking bags to support a minimal load if you need to. ‘Sportive’, ‘Endurance’ and ‘Gran Fondo’ marketed bikes include minor design and geometry changes to optimise comfort over a ‘race’ road bike, and even have a nice wide spread of gears. Example: Cannondale Synapse. 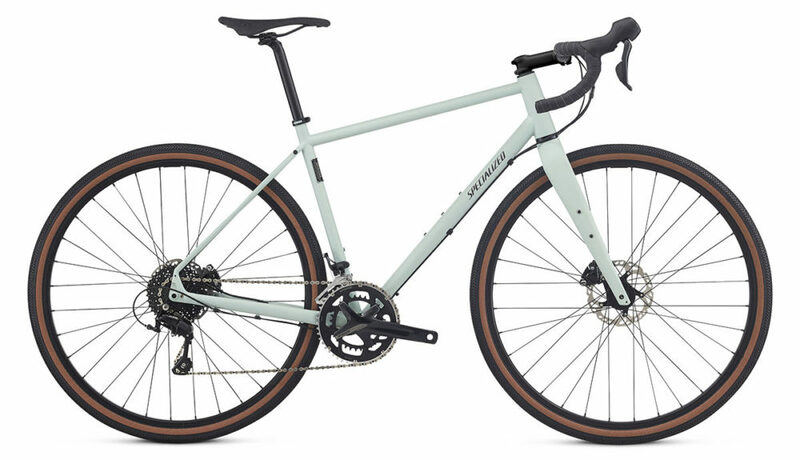 This relatively new category of touring bike is essentially a 29er (700c) mountain bike with a higher front end and provision for racks, lights and water bottle cages. The advantage with these bikes is that you can fit 2.4″ mountain bike tyres (great on rough roads) and still have lots of clearance for mud. 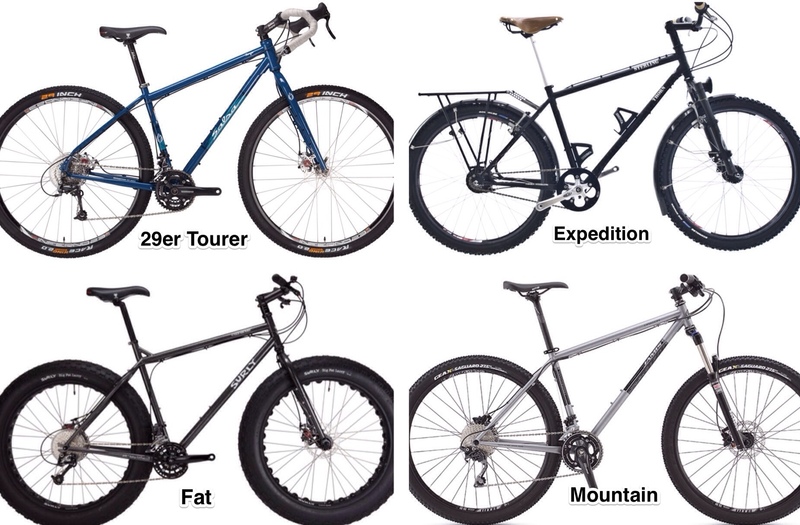 Examples: Salsa Fargo, Surly Ogre, Co-Motion Divide. A typical mountain bike, most noticeable by its front suspension fork, can be used as a dedicated touring bike. But be aware that mountain bike frames and parts can be designed around strength-to-weight, rather than outright stiffness, so light loads are recommended. Example: Jamis Dragon 650b. Expedition bikes are as close as touring bikes get to mountain bikes. They are specially designed to take on the worst conditions (snow, ice, mud, sand, corrugations) in the most remote environments. Although almost any long distance touring bicycle can be considered an ‘expedition’ bicycle (given their relatively bombproof part spec), expedition rigs take it up a notch again. They typically use 26″ wheels, 2.00″+ tyres, flat handlebars and sometimes Rohloff hubs. Example: Thorn Raven Sterling. What started off as a novelty has really taken off in the last few years. Fat and Plus bikes are most notable by their 3.0-5.0″ tyres which are capable of snow and sand riding in places that haven’t been explored by bike before. They are now being picked up by those adventurous enough to take on deserts and snowfields! 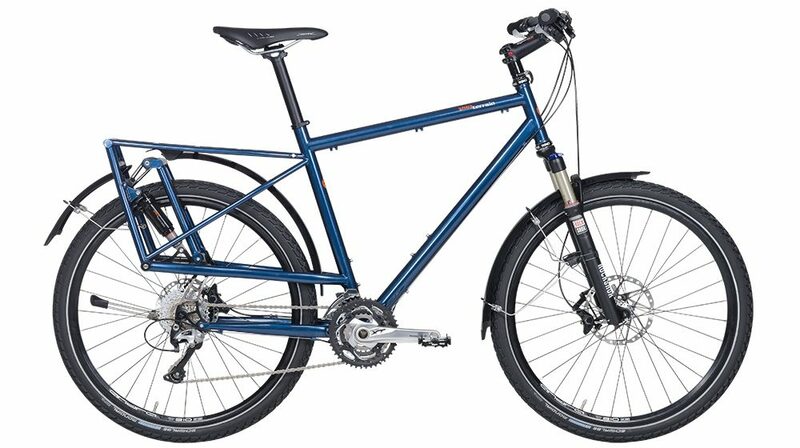 Example: Surly Moonlander. For More Examples of Touring Bikes, Check Out The Complete List of Touring Bicycles Available.